According to a new poll from the Pew Internet & American Life Project, a majority of American adults (56 percent) are now smartphone owners. That's up a full 10 percent over a poll from February of last year, and 21 percent higher than a poll from May of 2011. The poll taken among 2252 adults largely confirms demographic stereotypes in regards to technology: Men were slightly more likely to own a smartphone than women (59 percent versus 53 percent). Younger people were more likely to own a smartphone than older generations, with every age breakdown now sporting a majority of smartphone owners except for those over 55 (the highest was the 25-35 group where 81 percent owned a smartphone, and the lowest was the 65+ group where only 18 percent said they owned a smartphone). The higher the household income, the more likely a person is to own a smartphone: Smartphone ownership rates span from 43 percent for those in a household where the income was less than $30k all the way up to 78 percent for households making more than $75k. One trend that has been around for a while but may surprise a lot of people is that people of color are far more likely to own a smartphone than their white counterparts (black, non-Hispanic: 64 percent; Hispanic: 60 percent; white, non-Hispanic: 53 percent). Besides being more affordable, today's smartphones are nearly as powerful and certainly more capable than the PCs of the recent technological past, which means that the digital divide--in regards to Web access, at least--is on its way to being rendered wholly obsolete. The poll also took a look at the choice of smartphone platform among adult users. Over the past two years iPhone usage has exploded from 10 percent of all mobile phone usage (including "dumb" or feature phone) in 2011 to 25 percent of all mobile phone in 2013. At the same time, Android has jumped in front of the platform pack, leaping from 15 percent of all cell phone users in 2011 to 28 percent in 2013. Once-dominant BlackBerry has steadily declined from 10 percent in 2011 to only 4 percent today. And Windows Phones also managed to shrink from 2 percent of the mobile phone market in 2011 and 2012 to only 1 percent today. These findings generally make sense as Android handsets such as Samsung's line of Galaxy phones have become a favorite among the press and populace, and have been able to challenge the iPhone's claim to the only premium phone in the business. As Windows makes a bid with phones such as Nokia's Lumina line, which have proven successful in other parts of the world, it is possible that the breakdown may look markedly different next year. Men were more likely to own an Android than women (31 percent versus 26 percent), while women hold a slight advantage over men in regards to iPhone usage (26 percent for the ladies compared to 24 percent for the fellas). In regards to age breakdown, there is a bell curve among iPhone users that peaks in the 25-34 year old bracket (34 percent) and then diminishes the higher up the age ladder you go (down to 11 percent for the 65+ age group). Meanwhile, Android usage by age forms a straight decline beginning at 43 percent for the 18-24 group and sloping with each group until hitting only 7 percent for the 65+ group. Since Android phones often have a lower cost of entry, it makes sense that younger (and therefore poorer) users would prefer Android phones and that the usage would drop from there. White smartphone users were slightly more likely to be iPhoners (27 percent of all white mobile phone users are on iPhones versus 26 percent on Android), while Hispanic users were the flip and were only slightly more likely to be Android users (26 percent iPhone users versus 27 percent for Android). Meanwhile, black Android users (42 percent of all black mobile phone users) far outnumbered black iPhone users (only 16 percent). 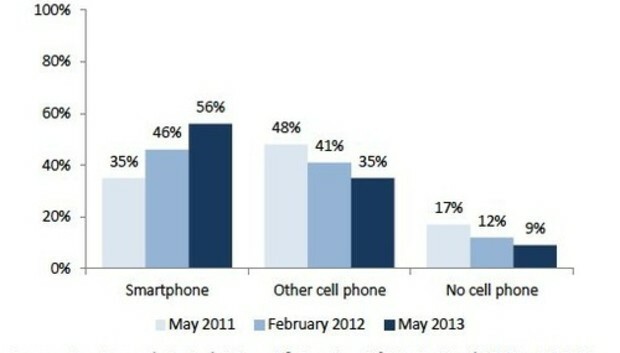 The biggest takeaway from the poll is that smartphone in the United States are now the norm. The majority of adults are carrying small powerful computers with them and have access to the entirety of the Web almost anywhere they go. This represents a seismic shift in society from even only a few years ago as the virtual world creeps evermore into the actual.